South Korea defeated Costa Rica 2-0 in a men's football friendly match on Friday, giving their new coach Paulo Bento a victory in his debut before a sellout home crowd. Midfielder Lee Jae-sung knocked home a rebound after Son Heung-min's penalty attempt rang off the post in the 35th at Goyang Stadium in Goyang, north of Seoul, while fellow midfielder Nam Tae-hee scored his first international goal in nearly two years for second-half insurance. Bento, the former Portugal boss named South Korea head coach on Aug. 17, enjoyed a convincing victory over the world No. 32. 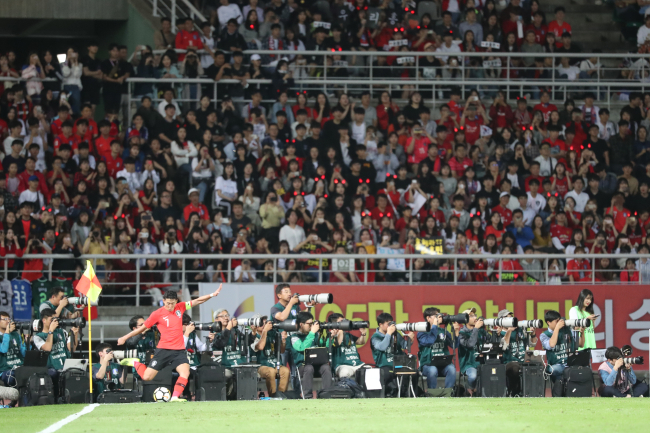 The Korea Football Association (KFA) said 36,127 fans packed Goyang Stadium for South Korea's first sellout at home since a friendly against Brazil in 2013. Bento threw a 4-2-3-1 formation at Costa Rica. Ji Dong-won of FC Augsburg was the featured target man in his first international match since October 2017. Son and Lee were the wingers, and Nam started as the attacking midfielder. Long-time midfield partners Ki Sung-yueng and Jung Woo-young were back in their familiar roles. The starting back four featured Hong Chul, Kim Young-gwon, Jang Hyun-soo and Lee Yong. Jo Hyeon-woo, the No. 1 goalkeeper at both the FIFA World Cup and Asian Games this year, was ruled out with a knee injury, paving the way for Kim Seung-gyu's first start in net in three months. Lee Jae-sung for South Korea and Elias Aguilar for Costa Rica traded chances in the opening moments. South Korea enjoyed a substantial edge in ball possession while not giving Costa Rica much room to maneuver on the other end. Son nearly gave South Korea a lead in the 28th with a cannon from the top of the box, with Esteban Alvarado foiling the bid with an outstanding save. Five minutes later, Nam Tae-hee drew a penalty when he was brought down by Christian Gamboa inside the box. Son, the designated penalty taker, fired a shot that ricocheted off the right post and found its way to Lee, who calmly poked it into the empty net for a 1-0 lead. Alvarado was down on the ground after attempting a diving save and watched helplessly as Lee's reactive shot found the back of the net. Alvarado kept it a one-goal affair in the 41st: Nam took a nifty feed from Lee and moved in alone on the Costa Rican custodian, who denied the midfielder his first international goal in nearly two years. But Nam, a 27-year-old veteran of the Qatar Stars League, wouldn't be denied again in the second half. With South Korea coasting for an extended stretch while displaying less zip or intensity than in the first half, Nam provided a jolt with a highlight-reel goal in the 78th. Nam drove down the left flank and shed David Guzman just outside the edge of the box. He then cut toward the center and fired one to the top left-hand corner, well out of Alvarado's reach, just before defender Bryan Oviedo could get to him. It was Nam's first goal for South Korea since November 2016. Costa Rica didn't have a shot on net in the first half and barely tested South Korean goalkeeper Kim Seung-gyu. For the match, South Korea outshot Costa Rica 7-1. Defender Kim Moon-hwan and midfielder Hwang In-beom, both members of the Asian Games championship team, made their senior international debuts in the second half off the bench.